Just found these parts among a box of misc toys. I know some of the parts in the first photo are Masters of the Universe, but as i never collected them thats as far as i know. No. 11 i know is from Skeletor, but which version? 18 & 21 maybe MASK? 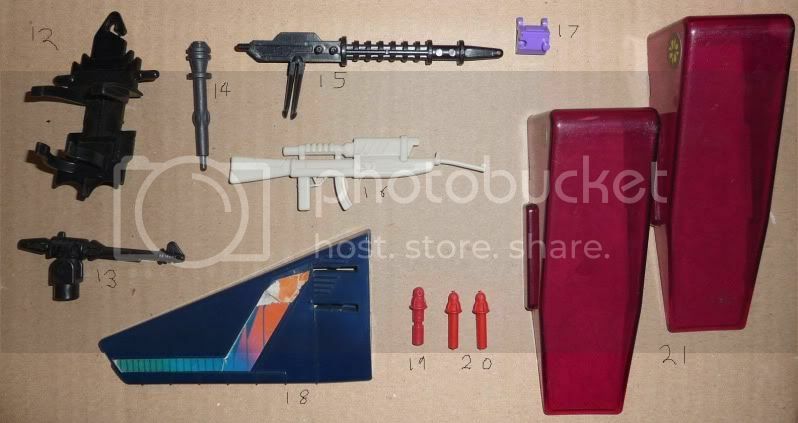 14 has bugged me for years, it's exactly the same mold as a vintage Star Wars B-Wing gun except its shorter and is made to fit on something, the original is three times as long and one piece. So what can you ID? Now you know, and knowing is .... um.... sorry i forgot the rest! 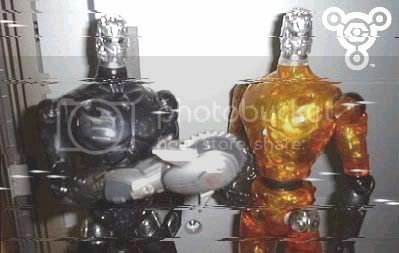 Last edited by Nordland; 11-17-2011 at 09:16 PM..
6,7,10,& 11 All go to the Masters of the Universe toyline. 19 and 20 look like MASK missles but I am not sure. Do you know which figures though? Thanks for the MASK ID's. I had the toys 13 is from too, but I can't remember what they were called. They were a space/building toy kinda like supersized legos. The cockpits plugged into the blocks and there were rings to plug different blocks together....there were cubes about 2 inches on a side and rectangles that were 2x2x3 or 4. The cockpit modules came in blue and red and the connecting rings had posts those guns connected to. The set I had also had wheels so you could make a tank like vehicle and there was a 2 person cockpit as well. Here is a couple for you. #2 is same line, character Sahak, who also used the same armor.